Casablanca desert trip: 8-day Imperial cities and Sahara tour from Casablanca. You will visit the main historical cities and sites, and experience camel riding in the Sahara desert of Morocco. 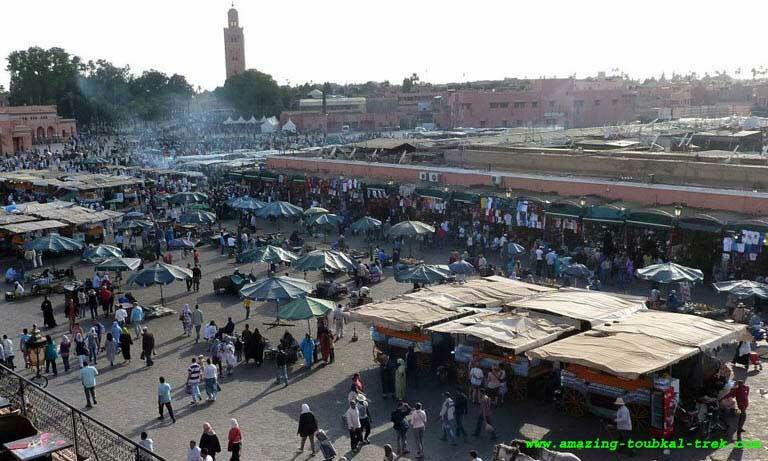 – Visit the ornate palaces and monuments of Marrakech. Welcome to the largest city in Morocco, Casablanca. Once you arrive, you will meet your driver/tour guide. Depending on how late you come, you will have a short tour of the city, and see a small glimpse of what makes the city so unique. 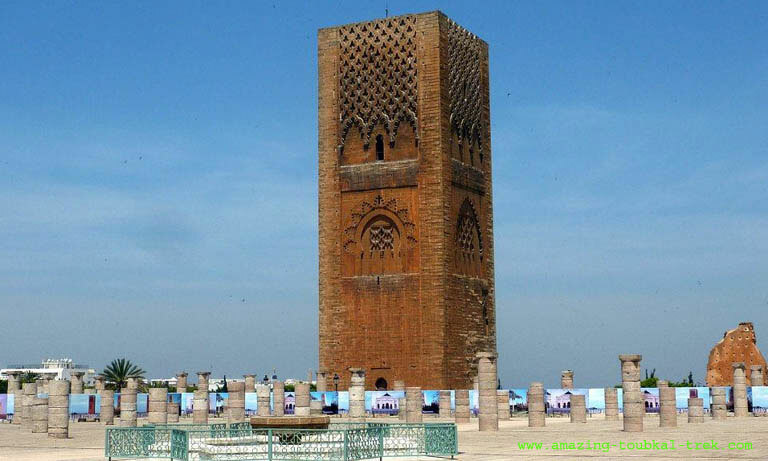 You may get the chance to see attractions like the United Nations Square, the central market, and the Hassan II mosque (which is open to non-Muslims). End the day with dinner and rest at the hotel. Prepare for an early departure for Fez with an early breakfast. Along the way, we will make a stop in Rabat, the capital city of Morocco. In the city, you will get to encounter the crenelated red ocher walls, which extends for more than 5 km – a very distinguishing feature of the town. From there we will pass through the medina and the souks, then you will see the contrast by coming across the Kasbah of the Odayas. After that, we will visit the Hassan Tower and the remains of the mosque that was there, as well as the mausoleum that is next to the tower. From there it’s time to head to the modern town where the royal palace is located, home to the King of the Merinide dynasty. 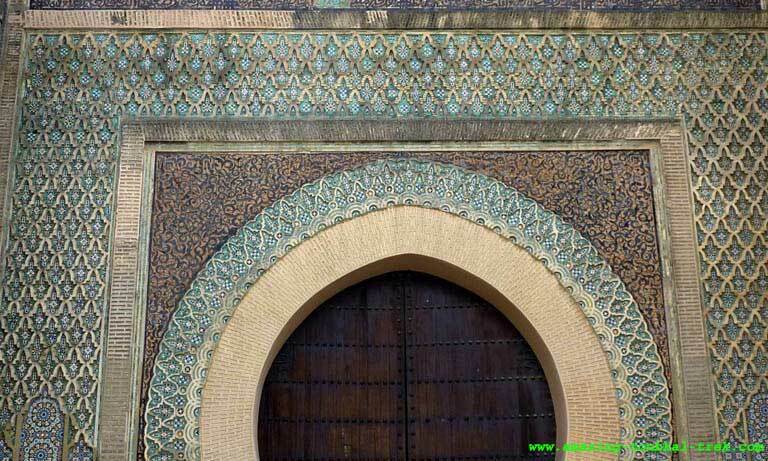 After lunch at a local restaurant, we will continue on our way to Meknes, where the tour will give you a glimpse of the wall and massive gates that date back to the 17th century. We will also make a stop at the Mausoleum of Moulay Ismail, which was once known to be the only mosque in Morocco that allowed non-Muslims. Moving on, “Dar Jamai,” the Museum of Moroccan Art will be the next stop, which will overwhelm you with the variety of hand-crafted goods. 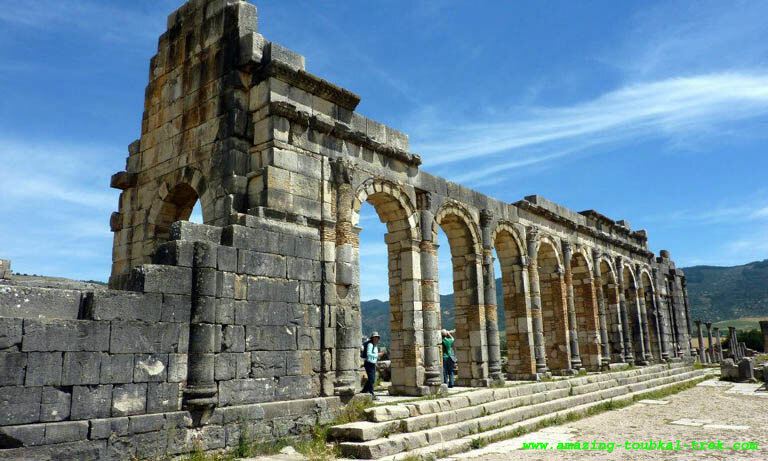 The last stop before arriving in Fez is the Roman ruins of Volubilis, where you will get a taste of what life was like almost 2000 years ago. 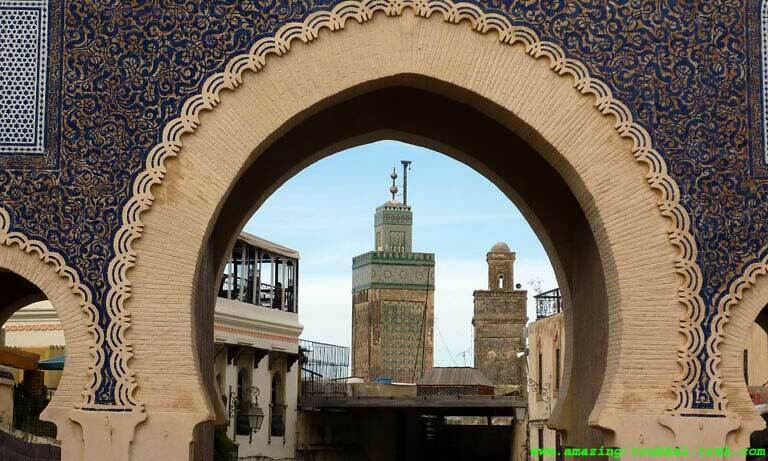 In the evening we will arrive in Fez, eat dinner, and prepare for the next day. The day begins with an excellent breakfast, and then a guided tour of the medina, one of the largest walled-in cities in the world. You will notice how crowded the narrow streets are, filled with fresh fruits, an abundance of spices, and traditional Moroccan arts and crafts. 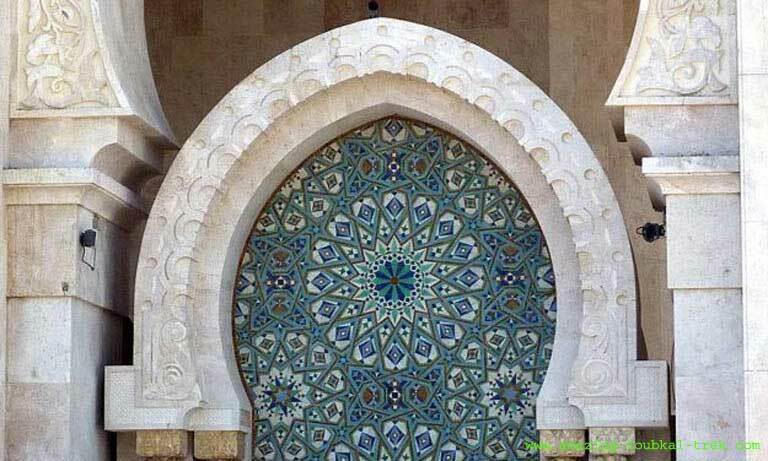 There are also two mosques to visit, the Quaraouiyine and Andalusian Mosques, which date back all the way to the 800’s. After those stops, we will also visit exotic fountain areas, the Batha Palace which is now a museum for art, Chouwara Tanneries, various souks, the King’s Palace, and the famous Boujloud with the vibrantly colored ceramics. We will then wind down the day with a beautiful dinner at a local restaurant. Prepare for the long trip for today with an early breakfast. On the way to Merzouga, our first sight to see is Ifrane, the Swiss-styled ski resort built by the French in the 1930’s. After that will be a long trip through the Atlas Mountains, consisting of forest, rock ledges, and small villages. About halfway through we will make a stop in the town of Midelt for lunch and learn about its rich past of rocks and fossils. Just before sundown, we should arrive in Merzouga where you will enjoy food and entertainment. 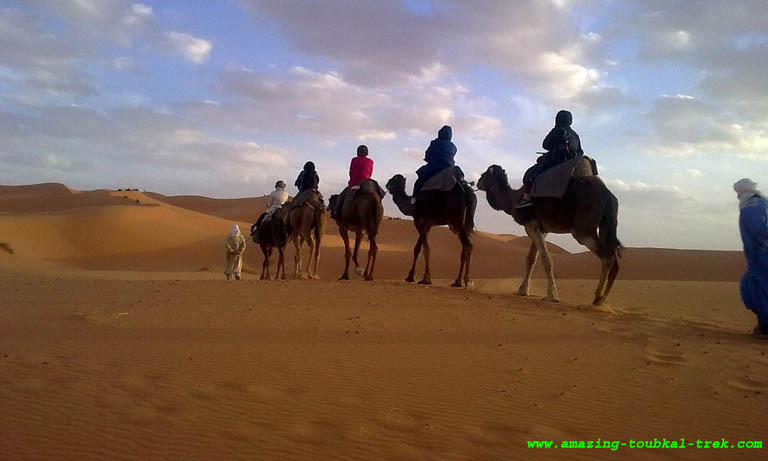 You will also have a chance to ride a camel over to witness the sunset or sunrise in the Erg-Chebbi dunes. We will get ready for the day with a unique, traditional Berber breakfast. After that, it’s time to depart for Ouarzazate and stop a couple of times along the way. The first stop will be the village of Rissani, which is the home of the Alaouite dynasty. Next stop is the Sijilmassa, which is the old center of all desert trading, and some kasbahs. From there we continue along the route of the “Road of a Thousand Kasbahs” on our way to Ouarzazate. We will also pass through the Ziz valley that is home to many gorges. We will make a break for lunch and walk about in the Gorge Todra, then move through Dades and Rose Valley before finally arriving in Ouarzazate for dinner and overnight resting. Upon finishing breakfast, we will get a chance to explore the town of Ouarzazate, which includes the Kasbah of Taourirt and the movie studios of Atlas Studios. From there we hop over to Fint Oasis, then stop in at Ait Benhaddou for a quick lunch. 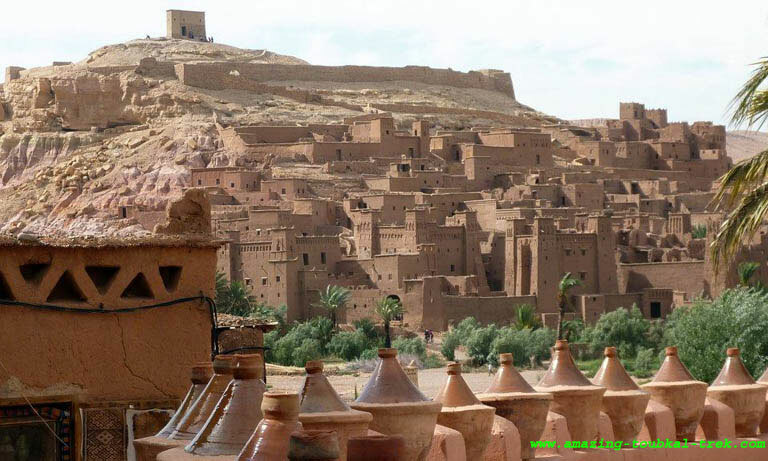 Again we will get to see a Kasbah, but this time a famous one that you can find in movies like The Gladiator, or Babel. 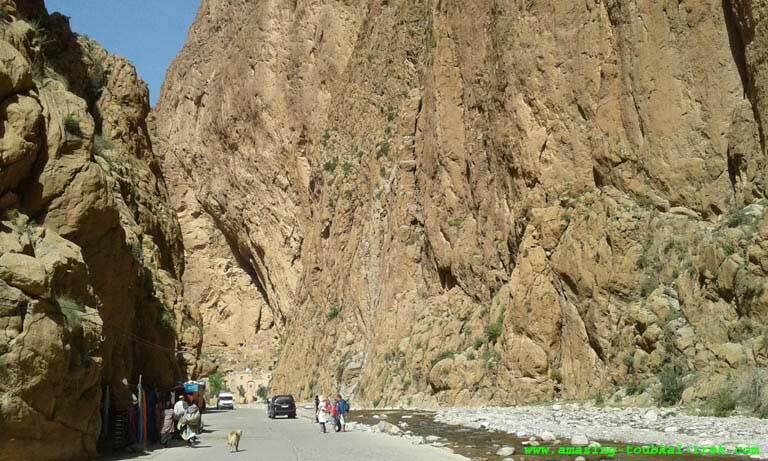 As we continue and pass through the High Atlas, we will take a road that ascends to almost 2,300 meters above the sea level, and see small villages and waterfalls along the way. By the afternoon we should arrive in Marrakech where we end the day with food and drinks. This day we will spend entirely on a tour of Marrakech. This day’s adventures include a trip to the Menara Gardens, a breath-taking pool with fantastic scenery, the Koutoubia Minaret, Saadian Tombs, and the Museum of Dar Si Said. Lunch will be at a local restaurant, and after will be a quick tour of the souks of Marrakech. Dinner and entertainment at the end of the day, including some drinks while taking in the scenery while overlooking Jamaa El Fna square. Travel back to Casablanca and prepare for leaving Morocco. Enjoy breakfast and travel to the airport. End of Casablanca desert trip. – Casablanca desert trip is available and can be arranged for groups of all sizes. Casablanca desert trip: Private tour from Casablanca to explore Imperial cities, and to ride camels in the Sahara desert. Casablanca Desert Trip, Imperial Cities and Sahara Tour.